Ahoy there me mateys! I received this short story collection eARC from NetGalley in exchange for an honest review. So here be me honest musings . . . 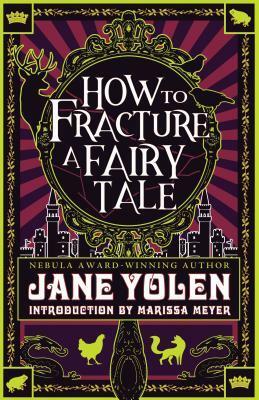 While I have read many of Jane Yolen’s works, most have been her novels. It has only been recently that I have been reading her short stories. This collection has 28 varied tales. In addition, the end of the book has author reflections on how the stories came to be along with some of her poetry. “Snow in Summer” – a Snow White retelling with a fantastic answer to what happens to the evil queen. “The Moon Ribbon” – this one has a bit of Cinderella (which I know) and a bit of The Princess and the Goblin (which I don’t). It was weird but I rather liked it. “One Ox, Two Ox, Three Ox, and the Dragon King” – this was the seventh story in the collection and the first one I really loved. It tells the story of dragons from a Eastern perspective but with a Western solution. “Brother Hart” – this tale was apparently based on the Russian/ Grimm story of Little Brother, Little Sister. I am not familiar with that tale at all but I loved this story. It deals with transformations and loving sibling relationships. “Sun/Flight” – a tale based on the Icarus myth. I didn’t love it but I found it oddly beguiling and interesting. “The Foxwife” – this story features a kitsune. Ever since I read shadow of the fox, I have loved takes on the kitsune Japanese folk tales. Yolen also recommend foxwife by Kij Johnson. I will have to check that one out. “The Faery Flag” – this is based around the Faery Flag legend of Scotland about the McLeods on the Isle of Skye. I got tired of faery stories a while back. This was a breath of fresh air. “One Old Man, with Seals” – this one is based on the Greek shapeshifter, Proteus but set in 20th century America. It has a lighthouse and the sea. Awesome! “Sleeping Ugly” – an absolutely lovely fracturing of Sleeping Beauty. The ending! “Green Plague” – a fun mix of frogs and the Pied Piper of Hamelin. Silly and fun. “The Unicorn and the Pool” – it has an unicorn! Short and bittersweet. “Sule Skerry” – this is a tale of selchies of the Scottish Islands inspired by the song “The Great Selchie of Sule Skerry.” Lovely. “Cinder Elephant” – another Cinderella retelling where our protagonist is overweight and a bird watcher. This was a lovely, wonderful tale. The poem and description about writing this tale was absolutely fabulous as well. I think this was me favourite. “Mama Gone” – a fairy tale about vampires that is both sad and sweet. Seriously. I be very grateful to have a chance to read these stories. While I didn’t love every story, I do have a few new favourites of hers. Arrrr! Yolen is lovely. I am falling in love with her short story collections. Thanks for the comment. I also received an ARC for this book, but I was unable to read it before publication. (I’m so bad about that) — I am looking forward to reading these short stories. I also have read many of Yolen’s novels, so I’m interested to compare my experience reading this collection to your experience. I wonder where we will differ! Only time will tell. 😉 Great review! The publishing house is so nice that they gave me arcs on Edleweiss way after the publication date when I said why I wanted to read them. They are excited whenever their books get reviewed. So no worries about not getting them read before publication. Short story collections take me longer to read then novels because I have to space the stories out. Partly so I can ponder them and partly because if I don’t then they can blur together. I hope ye like these. And I be interested to see where we differ as well. I do wonder what yer take on the Jewish tales will be like since ye be Jewish. I only know Jewish religion things from a religions class, me Jewish friends, and working on the Dybbuk play. And me mind is a sieve so facts fall out a lot. Arrr! Exactly! I find that reading one story a day is all I can do with collections, oftem. I like to give them space and time to grow into their own place in my mind. I don’t like it when they all blur together — plus, this helps me write a stronger review. Ooooh. I didn’t realize there were Jewish tales in this collection. This doesn’t surprise me, as Jane Yolen is a practicing Jew. I am super curious… Is it clear which ones come from Jewish tales? I mean, obviously Slipping Sideways Through Eternity is. Does this come up in Yolen’s reflections at the end? Ye definitely know which tales are from Jewish ones. Plus she does reflect on it a tiny bit at the end. This is a book of short stories. So no prior novels 🙂 I love the author so I read them all. I didn’t like them all but that is more the fault of me and not the writing. Thanks for the comment! Sorry not all the stories in this worked for you! That tends to be the case with short stories. It all works out in the end. Thanks for taking the time to read and comment. Arrr! I do like her writing style and think she is very talented. I look forward to readin’ yer review. Arrr!